Flames burn near power lines in Sycamore Canyon near West Mountain Drive in Montecito, Calif., Dec. 16, 2017. This undated photo obtained from the Santa Barbara County Fire, shows flames from the Thomas Fire near homes. Cal Fire captain Jason Novak observes fire behavior during a firing operation at the Thomas Fire above Los Padres National Forest, Calif., Dec. 13, 2017. Novak is part of the Cal Fire Lake Napa Unit. A Cal Fire firefighter observes fire behavior during a firing operation in the Los Padres National Forest, Calif., Dec. 13, 2017. Wildfire flames burn on a hillside from the Thomas Fire near Montecito, Calif., Dec. 12, 2017. 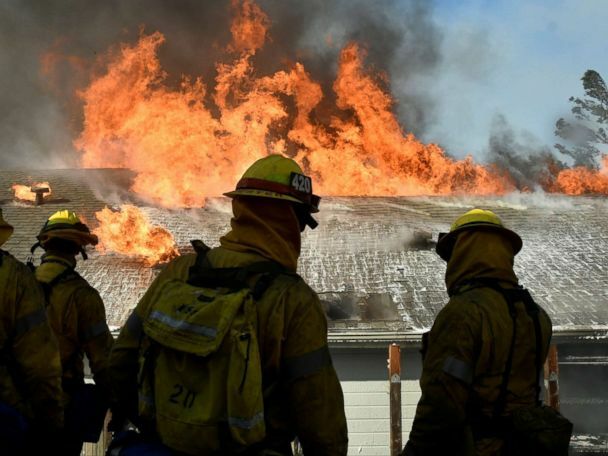 <br><br> More than 6,000 fire personnel are still battling the Thomas fire, which has singed more than 234,000 acres and has destroyed nearly 800 structures. A vehicle burns after the Thomas Fire surged through Toro Canyon, Calif. on Dec. 11, 2017. By midnight the fire had burned over 230,000 acres, was 20% contained, destroyed 880 homes, and was the 5th largest fire in California state history. Firefighters battle flames on State Route 150 between Carpinteria and Ojai Calif., Dec. 11, 2017. Christmas decorations illuminate a house as the growing Thomas Fire advances toward Santa Barbara County seaside communities, Dec. 10, 2017, in Carpinteria, Calif.
Firefighting helicopters try to save a house from the Thomas wildfire in Carpinteria, Calif. on Dec. 10, 2017. Fire fighters attack the Thomas Fire's north flank with backfires as they continue to fight a massive wildfire north of Los Angeles, near Ojai, Calif., Dec. 9, 2017. Patricia Hampton wipes away tears on her cot at the county fairgrounds in Ventura, Calif., Dec. 7, 2017. Wildfires menacing the greater Los Angeles area have forced thousands of evacuations; Hampton lost her home on Monday. "Whenever I think about it I start crying," she said. Firefighters work to extinguish the Thomas Fire as it burns past the 101 Highway towards the Pacific Coast Highway in Ventura, Calif., Dec. 7, 2017. 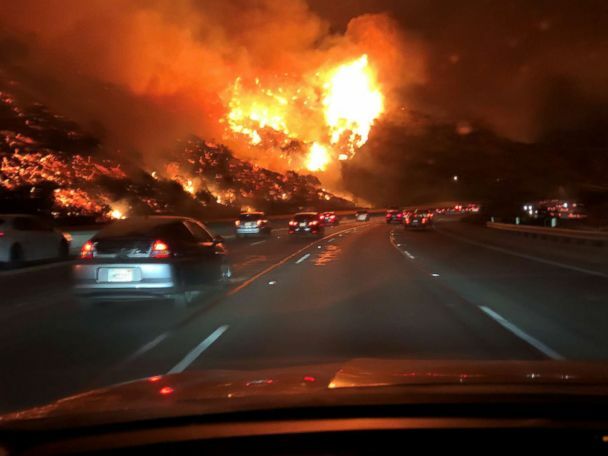 The Thomas Fire reaches the Northbound 101 freeway north of Ventura, Calif. As of late Dec. 6, the Thomas fire had grown to 96,000 acres and was 5 percent contained as the blaze continued to rage and caused more evacuations in Ventura County. Jeff Lipscomb embraces his daughter Rachel, 11, as they stand over where her room was and see her burned collection of books after their home was destroyed in a fire in Ventura, Calif., Dec. 6, 2017. Flames consume a home as a wildfire burns in Ojai, Calif., on Dec. 7, 2017. Firefighters monitor a section of the Thomas Fire along the 101 freeway on Dec. 7, 2017 north of Ventura, Calif. The firefighters occasionally used a flare device to burn-off brush close to the roadside. Strong Santa Ana winds are rapidly pushing multiple wildfires across the region, expanding across tens of thousands of acres and destroying hundreds of homes and structures. NASA astronaut Randy Bresnik shared images of the Southern California wildfires taken from the International Space Station on Dec. 6, 2017. Paul and Erica Mattesich embrace before sifting through rubble at their Ventura, Calif., home on Dec. 6, 2017. The family lost their house when the Thomas fire tore through their neighborhood on Colina Vista. A painting rescued by firefighters sits on the ground as they work to extinguish fires in a home during the Skirball Fire which began early morning in Bel-Air, Calif. Dec. 6, 2017. A firefighter walks out of a vineyard owned by Rupert Murdoch that was damaged by the Skirball fire near the Bel Air neighborhood on the west side of Los Angeles, Dec. 6, 2017. Burnt cars lie among the ruins of the Hawaiian Village apartment complex that was destroyed by the Thomas Fire in Ventura, Calif., Dec. 6, 2017. Gordon Fischer rests in an evacuation center set up at the Ventura County Fairgrounds after he was displaced by the Thomas Fire in Ventura, Calif., Dec. 6, 2017. Firefighters remove furniture from a home destroyed in a wildfire in the Bel Air district of Los Angeles, Dec. 6, 2017. Los Angeles firefighters battle to contain flames to a burning home and prevent the fire's spread to adjoining properties in the Bel Air district of Los Angeles on Dec. 6, 2017. Vehicles pass beside a wall of flames on the 101 highway as it reaches the coast during the Thomas wildfire near Ventura, Calif., Dec. 6, 2017. Heavy smoke covers the seaside enclave of Mondos Beach beside the 101 highway as flames reach the coast during the Thomas wildfire near Ventura, Calif., on Dec. 6, 2017. Brushfire near the 405 Freeway in the Bel-Air neighborhood of Los Angeles, Dec. 6, 2017. A Los Angeles County firefighter prepares to battle a hot spot on the "Creek Fire" in the Lake View Terrace area of Los Angeles, Dec. 5, 2017. Firefighters work to put out a blaze burning homes early on Dec. 5, 2017, in Ventura, Calif. Authorities said the blaze broke out Monday and grew wildly in the hours that followed, consuming vegetation that hasn't burned in decades. Horse owners start to evacuate their horses as the Creek Fire intensifies on Foothill Blvd in Lake View Terrace, Calif., Dec. 5, 2017. A man watches as a wildfire burns in Ventura, Calif., on Dec. 5, 2017. A man uses a hose to extinguish the Creek Fire as it burns along a hillside near homes and horses in the Shadow Hills neighborhood of Los Angeles on Dec. 5, 2017. Homes burned to the ground by the Thomas fire are viewed from a helicopter in Ventura County, Dec. 5, 2017, Ventura, Calif.
A wildfire threatens homes as it burns along the 101 Freeway Tuesday, Dec. 5, 2017, in Ventura, Calif. Smoke rises behind a leveled apartment complex as a wildfire burns in Ventura, Calif., Dec. 5, 2017. A photo released by the Ventura County Fire Department shows the Thomas Fire, which forced more than 25,000 people to evacuate Ventura, Calif., Dec. 4, 2017. Over 4,000 firefighters are battling four wildfires in Southern California.